I.) Is Your Estate Worth Managing? II.) Could Your Estate Be Better Managed? This report is aimed at those in Management (with little experience in licensing) faced with the challenges of Software Asset Management. It may also help software asset managers and licensing experts convey information to their management. These six decisive questions tackle the main challenges companies are faced with regarding Software Asset Management. They will help you to discover the disparities in your organization and to define your objectives for Software Asset Management (SAM). Chapter (I.) – Is Your Estate Worth Managing? – answers three questions related to your estate footprint and complexity. Some customers have large software estates composed of hundreds of servers or thousands of workstations. Furthermore, their estates may be riddled with complexity: they may use products licensed from major vendors such as Oracle, IBM or Microsoft; their infrastructure estate may be internationally distributed – even outsourced to a provider of hosting or IT services; they may use virtualization technology for server, desktop or application virtualization. Their annual spending on software licenses (CAPEX, OPEX) may be very high – and they may even have agreed to an enterprise agreement, such as Oracle ELA or ULA, Microsoft EA or IBM iESSO. Chapter (II.) – Could Your Estate Be Better Managed? – details three questions related to the management of your estate. A dedicated organization for Software Asset Management (SAM) is an adequate start when it comes to managing your license estate. A SAM tool, such as Spider, SmartTrack or Matrix42, promotes transparency and helps with generating accurate compliance balances – and supports mandatory license administration tasks. Licensing expertise for the main products and vendors you use – and the smaller vendors with high audit risk – is highly recommended. Customers should actively manage an audit (time, process, data) and the auditors – and install a Secure Data Room (for data security). In the Appendix we disclose a detailed evaluation framework for these questions. These three questions deal with judging the complexity of your estate, i.e. your software, infrastructure and license estates. Q1 – Do you have a large software estate? Do you have a large server software estate supported by hundreds of servers? Do you have a large client software estate supported by thousands of computers? Do you use products licensed from Oracle/IBM/Microsoft or other critical vendors? Q2 – Do you have a complex, heterogeneous infrastructure? Do you have an internationally distributed, heterogeneous infrastructure? Have you outsourced parts of your infrastructure (hosting, service providers)? Do you use virtualization technology for server, desktop or application virtualization? Q3 – Do you have a large, complex license estate? Do you purchase software licenses or maintenance at high costs (EUR)? Do you have any vendor agreements in place? Do you acquire licenses through an international, decentralized purchasing organization? If you answered “yes” to any of the questions above, your estate is worth managing. A detailed evaluation of questions Q1, Q2 and Q3 can be conducted using the framework proposed in the appendix. These three questions deal with managing your estate, regarding Software Asset Management, licensing expertise and compliance audits. Q4 – Do you need functional Software Asset Management (SAM)? Do you need a dedicated SAM organization (centralized/decentralized)? Do you need to generate accurate compliance balances using a SAM tool? Do you still have mandatory license administration tasks waiting to be completed? Q5 – Do you need licensing expertise? Do you need further licensing expertise for the main products/vendors you use? Do you need further licensing expertise for smaller vendors with high audit risk? Do you need to make changes to your infrastructure for it to be fully compliant with all licensing requirements? Q6 – Have you been confronted by compliance audits in the past? Have you ever been confronted by vendor audits in the past? Have you ever been required to pay any penalties / settlement claims (EUR)? Do you think that you could have better managed audits (time, process, data) and auditors, or could have installed a Secure Data Room to protect your data? If you answered “yes” to any of the questions above, your estate could be better managed. A detailed evaluation of questions Q4, Q5 and Q6 can be conducted using the framework proposed in the appendix. The following questions (in the next section of the Appendix) should be answered with regards to your specific organizational setup. Each answer corresponds to a value from 1 to 3 (1 = low, 2 = medium, 3 = high). After answering all the questions and gaining a value for each one, calculate the average to gain an overall evaluation. The higher your average evaluation, the more valuable SAM is for your organization. We recommend customers to tackle each single question on the side of caution, giving an indication of the potential or latent risk, rather than understating it. An average evaluation over 2.5? Software Asset Management (SAM) should be of major importance for your organization, its benefits largely outweighing its costs. Furthermore, you should consult a licensing specialist, as your particular situation seems to have large potential risks. An average evaluation between 1.5 and 2.5? You should further analyze which selected aspects of Software Asset Management (SAM) would benefit your organization. An average evaluation between 1.0 and 1.5? You should further analyze the questions to which you answered with the highest values, especially if those are related to licensing expertise or compliance audits. Some specific aspects of Software Asset Management (SAM) could benefit your organization. Q1 – A large software estate, spread across hundreds of servers and thousands of client computers (workstations), results in more lengthy licensing tasks. Using products licensed from Oracle/IBM/Microsoft – or other vendors with aggressive tendencies regarding audits – requires broader licensing knowledge. Q2 – A heterogeneous infrastructure – mixing mainframes and servers, thin and fat clients, hardware and virtualized environments – creates subsets with various infrastructure and licensing requirements. Furthermore, there is an additional organizational layer in case an outsourcer provides part, or all, of the infrastructure – rendering licensing data collection more difficult. Virtualization technology for server, desktop or application virtualization increases the number of products in use and the dynamic nature of the infrastructure – and thus increases licensing requirements. Q3 – High purchase volumes (EUR) for licenses and maintenance generate a large license estate, high CAPEX (depreciation on licenses) and high OPEX (maintenance) – all need to be dealt with. Vendor agreements – such as Microsoft Enterprise Agreement (EA) and Oracle Unlimited License Agreement (ULA) – impose stricter licensing rules and restrictions. An international, decentralized purchasing organization reduces the transparency of license purchases. Q4 – A dedicated SAM (Software Asset Management) organization, encompassing major products/vendors/subsidiaries, is key to having functional SAM. The ability to generate accurate compliance balances using a SAM tool is vital. Also, your mandatory license administration tasks should be completed, such as IBM Sub-Capacity reporting, Oracle license termination, and Microsoft license transfers in MVLSC. Q5 – Your licensing expertise is sufficient if it covers the main products/vendors you use, as well as any vendors with aggressive tendencies regarding audits. You should have already adapted your infrastructure to be fully compliant with all licensing requirements. Q6 – The compliance audits you have been confronted by in the past are a good indicator of your licensing compliance, as are the settlement claims (EUR) you may have been required to pay. Customers should reflect on whether they could have more actively managed audits (time, process, data) and auditors, or could have installed a Secure Data Room to protect their data. Do you have a large server software estate with hundreds of servers? Do you have a large client software estate with thousands of computers? License assets – Do your license assets have a high value (i.e. replacement value – value of new purchases of licenses at current price, including regular customer discounts)? < EUR 10 mil. ≥ EUR 10 mil. ≥ EUR 50 mil. CAPEX – How high are your capital expenses (CAPEX) per year? < EUR 2 mil. ≥ EUR 2 mil. ≥ EUR 5 mil. OPEX – How high are your operating expenses (OPEX) per year? < EUR 2 mil. ≥ EUR 2 mil. ≥ EUR 5 mil. Oracle – Do you have Oracle agreements such as Oracle ULA (Unlimited License Agreement) or ELA (Enterprise License Agreement)? < EUR 10 mil. ≥ EUR 10 mil. ≥ EUR 50 mil. IBM – Do you have IBM agreements such as IPAA (Passport Advantage), iESSO (International Enterprise Software & Service Option) or CEO (Complete Enterprise Option)? < EUR 2 mil. ≥ EUR 2 mil. ≥ EUR 5 mil. Microsoft – Do you have Microsoft agreements such as EA (Enterprise Agreement) or Select Agreement? < EUR 2 mil. ≥ EUR 2 mil. ≥ EUR 5 mil. Other vendors - Do you have enterprise or discount agreements with, for example, Adobe, Attachmate, CA, Infor GS, Informatica, SAP or Symantec? < EUR 2 mil. ≥ EUR 2 mil. ≥ EUR 5 mil. Do you acquire licenses through international, decentralized purchasing? THIS REPORT IS AIMED AT THOSE IN MANAGEMENT (WITH LITTLE EXPERIENCE IN LICENSING) FACED WITH THE CHALLENGES OF SOFTWARE ASSET MANAGEMENT. 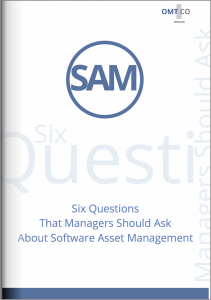 THESE SIX DECISIVE QUESTIONS TACKLE THE MAIN CHALLENGES COMPANIES ARE FACED WITH REGARDING SOFTWARE ASSET MANAGEMENT. THEY WILL HELP YOU TO DISCOVER THE DISPARITIES IN YOUR ORGANIZATION AND TO DEFINE YOUR OBJECTIVES FOR SOFTWARE ASSET MANAGEMENT.